Here are two common behavioral problems we see with young puppies, and how to deal with them through tried-and-true training methods. If you watch a litter of puppies playing, you will notice that they spend much of their time biting and grabbing each other with their mouths. This is normal puppy behavior. When you take a puppy from the litter and into your home, the puppy will play bite and mouth you. This is normal behavior, but needs to be modified so you and the puppy will be happy. The first thing to teach your new puppy is that human flesh is much more sensitive than other puppies and that it really hurts us when they bite. This is called bite inhibition. A puppy has very sharp teeth and a weak jaw. This means that the puppy can cause you to be uncomfortable when mouthing or puppy biting you, but can not cause severe damage. An adult dog has duller teeth and a powerful jaw. This means that an adult dog can cause significant damage when biting. ANY DOG WILL BITE GIVEN THE RIGHT OR WRONG CIRCUMSTANCES. If a small child falls on your adult dog and sticks a finger in the dog’s eye, you should not be surprised if the dog bites. If you do a good job teaching your puppy bite inhibition, you should get a grab and release without damage. If you don’t, you may get a hard bite with significant damage. It is simple to teach a puppy bite inhibition. 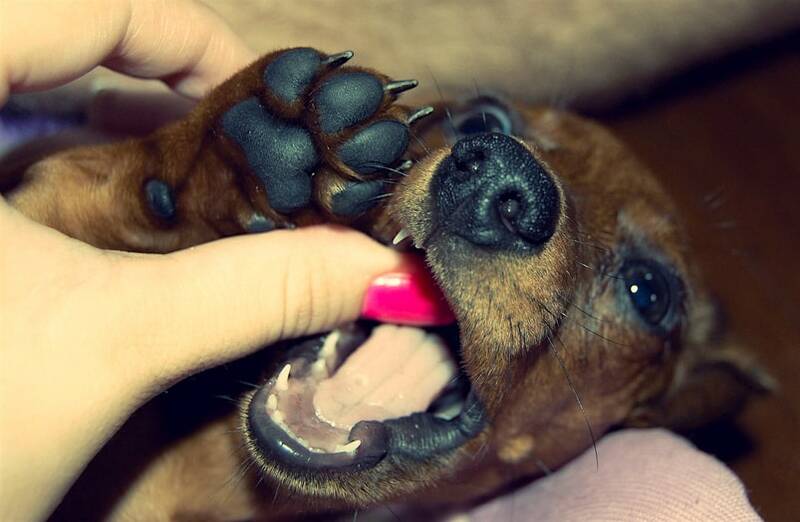 Every time the puppy touches you with its teeth, say “OUCH!” in a harsh tone of voice. This will probably not stop the puppy from mouthing, but over time should result in softer and gentler puppy biting. The commands necessary to teach a puppy not to mouth are easy and fun. Hold a small handful of the puppy’s dry food, say “take it” in a sweet tone of voice, and give the puppy one piece of food. Then close the rest of the food in your hand and say “off” in that same sweet tone of voice. When the puppy has not touched your hand for 3-5 seconds, say “take it” and give the puppy one piece of food. We are teaching the puppy that “off” means not to touch. You should do this with the puppy before every meal for at least 5 minutes. You say “OFF” before the puppy can mouth you. The puppy is mouthing you because of a desire to play. You have to answer the question, “Do I have time to play with the puppy now ?” If you do, then do “sit”, “down”, “stand” or other positive ‘lure and reward’ training. If the answer is “No, I don’t have time for the puppy, right now.” then you need to do a time out (crate, or otherwise confine the puppy, so the puppy can’t continue to mouth you and get in trouble. The above training methods have been modified from information from Dr. Ian Dunbar in his puppy training seminars and from his excellent video Sirius Puppy Training. Your puppy wants to be with the rest of the “pack” at bedtime. This behavior is highly adaptive from the standpoint of dog behavior. When a puppy becomes separated from its pack it will whine, thereby allowing it to be found and returned to the rest of the group. This is why so many books on puppies and dog behavior strongly recommend that you allow your puppy/dog to sleep with you in your room to reduce the liklihood of crying at night. Try moving the crate into your bedroom. If your puppy whines, first make sure it doesn’t have to go outside to eliminate. This means getting up and taking it outside. If the puppy continues to whine, try giving it a toy or chew toy and then simply ignore any continued whining. If you don’t reinforce the whining by comforting it (other than to take it outside — which is OK), it will eventually learn to settle down. Also, be sure to have a vigorous play session just before you are going to go to bed. This should poop it out and it will sleep much more soundly. Puppies that cannot sleep in the bedroom for whatever reason may be comforted by a ticking clock nearby, and a T-shirt of yours from the laundry. Puppies want attention. They will do a lot to get that attention — even if it is negative! Thus, if you scold your puppy for doing things you don’t want it to do, and ignore it when it is being good, you are reinforcing the wrong things. Ignore the bad things (or stop it without yelling or scolding) and enthusiastically praise it when its doing what you want, even if it’s as simple as sitting and looking at you, or quietly chewing one of its toys. This can be difficult to do, as it is essentially reversing all your normal reactions. But it is very important: You will wind up with a puppy that pays attention to you and is happy to do what you want, if it understands you. Joel Walton contributed to this article.